We had a lovely stay at Rockcrest House. David and Marian were perfect hosts and very helpful, from serving us tea on the cold rainy day we arrived, to making recommendations for dinner, to advising us on the best route for visiting the Ring of Kerry. The location is great--just across a footbridge from the center of Kenmare, and the B&B, with its gardens, is beautiful. We would highly recommend Rockcrest House to anyone visiting Kenmare. Lovely BNB in a garden setting with beautiful views of the countryside. We were tired when we arrived and decided to eat in the dining room. We were pleasantly surprised by the menu choices and the delicious meal, as well as the presentation. Our room accommodations were comfortable and spacious. We enjoyed our stay at Rockcrest House very much! Beautiful house, walking distance from town, lovely rooms, kind hosts, delicious breakfast! I recommend staying here! We stayed 1 night in September 2017 and it was very nice. 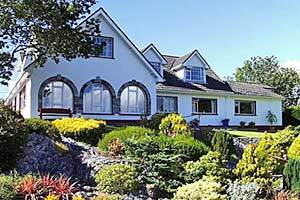 The hosts were great and Rockcrest House is just a short walk from Kenmare. Our room was very large and modern, with what looked like a newly remodeled ensuite bathroom. Couldn't have asked for a better breakfast - Marion made perfectly poached eggs. David was very helpful with advice on the Ring of Kerry. Great place! We stayed in early September for two nights. Our hosts were welcoming and helpful. The room were spotless,breakfast was excellent and we thoroughly enjoyed our stay. We are regular visitors to Kenmare and we will certainly be staying in Rockcrest House again. Rockrest House is located in a quiet side road, in only 5 minutes you are in the center of Kenmare. Very nice house with very friendly hosts. Our room was clean and tidy, the towels were changed daily. The breakfast was sensational! Beautiful home in perfect location; quiet, but only a few minutes walk into town. Hosts were wonderful, they did everything possible to ensure that our stay was perfect! We would absolutely stay here again next time we are in Ireland! Great location. Were able to walk into town for dinner, shopping, music. Room had a beautiful view of the surrounding countryside. Enjoyed the breakfast as well. Great value. My husband and I very much enjoyed our stay at Rockcrest House! Although we were only there for one evening, our hosts were extremely accommodating and breakfast was delightful in the morning. Kenmare was the perfect base for doing the Ring of Kerry and making the trek to Dingle! We loved this B & B in Kenmare. One of the nicest we stayed in during our two weeks in Ireland. Short walk into the charming town. Highly recommend. Very clean and new. Loved all the upgrades. Rockcrest House was a perfect place for our 2 day stay in Kenmare. It was an easy walking distance to the town centre and had such a beautiful outlook from our room. Our hosts were lovely and we would highly recommend staying here. This is a great, great establishment. The location is perfect with a short walk to village and really good dining. The hosts are so very accommodating, our room was superb being spacious, quiet, comfy bed and with a great view! Easy to find, great parking. Highly recommended! We enjoyed our stay at Rockcrest House B&B and will definitely stay with them again when we are in Kenmare. The home is beautiful as are the rock gardens. The host/hostess is knowledgeable and helpful about the area. The rooms are spacious and very nicely decorated. We had a beautiful view out of the front window of the bedroom. The B&B is close enough to walk to town. Breakfast was delicious. We thoroughly enjoyed our stay. From the spotless room and bath to the delicious breakfast, we could not have been more pleased. David and Marion were the perfect hosts during our two night stay. Highly recommend! In our 8 days in Ireland, our stay at the Rockcrest house was one of the best! Room was fantastic and the breakfast was excellent. I can't think how our experience could have been better! While only a day, we had a wonderful stay at Rockcrest. Warm and inviting service in a beautiful home! Myself, my wife, and my parents stayed here for two nights in mid-January. The owners Marion and David were amongst the friendliest people we met on our entire 10 day trip and truly lived up to the hospitality the Irish are famous for. They went out of their way to make sure we had everything we needed. It was easy to tell that they both care about their home and business as they were having renovations done while we were there and the property is in tip-top shape. The rooms were clean, showers warm, and the Breakfast was fantastic. Be sure to have the "Full Irish!" What a great location in a quaint town. A 2 minute walk along the river down a quiet street into town. The PERFECT base camp for exploring the Ring of Kerry. We would HIGHLY recommend this B&B to anyone visiting this part of Ireland and truly hope to be back someday!! A beautiful property on a quiet street out of the hubbub of Kenmare, but an easy walk to the action. David and Marian were very gracious. We even got real Vermont maple syrup with our pancakes! The rooms were spacious and the bed comfortable. A great jumping off point for the Ring of Kerry. You should stay here when you go to Kenmare. Extremely comfortable room with excellent en suite. Very varied breakfast menu with good portions. Quiet location within a 5 minute walk of the town's restaurants and bars. Our stay at the Rockrest House was very nice. We will stay there again, if we ever come to Kenmare again. One of the best stays in Ireland, real Irish football fans, beds was fantastic, full Irish breakfast lived on two meals a day. We loved Rockcrest B&B! The breakfast was delicious! We loved the homemade bread and pancakes. The portions were very generous too. The B&B was quiet, clean and very comfortable. It was within walking distance to Kenmare! What a great B&B! Rockcrest House is a beautiful B&B with wonderful hosts! Marion makes the best brown bread and has amazing fresh jam with breakfast. She was willing to make anyone whatever they wanted on the menu as well. We had a gorgeous view of the town from our room, and our room and bathroom were the most spacious we had while in Ireland. The short walk to town is so charming as you walk down a little hill along a stream. The price is affordable and surprising for the quality that you get. Highly recommend! Our stay at Rockcrest House was perfect in every. It's a wonderful home with warm and welcoming hosts David and Marian. It is located just a short stroll down a lane to the central part of town and within easy reach of the Ring of Kerry. David and Marian were extremely helpful in giving us tips on restaurants, pubs, driving directions, etc. Their breakfast was terrific. During our 2 weeks in Ireland we stayed in 8 different B&Bs. Rockcrest House is clearly at the top of our list. We would recommend this to anyone. Our recent stay was very nice. We had a big lovely room overlooking the beautiful landscape. Marion was accommodating as we had to leave a bit earlier than usual so she provided us with a lovely breakfast. It is a short walk into town and the surrounding areas are beautiful. This is a delightful B & B located within walking distance to all of the restaurants, pubs and shopping found in Kenmare. The property itself is beautifully landscaped, and our room was immaculate. Marion is a first class hostess, and her breakfast was the best we found on our recent trip. We have stayed here before, and will be sure to come back again on our next trip to Ireland. Good view, clean, up to date. We had such a lovely stay at the Rockcrest House B&B. Marian and David were beautiful hosts - incredibly accommodating, helpful with directions and suggestions for dinner, and the breakfast was delicious! The beds were as comfortable as a hug, and the entire grounds were gorgeous. Would absolutely stay again, and again, and again! We vacationed in Scotland & Ireland for 17 nights and Rockcrest was one of our favorite lodgings. We immediately felt comfortable and welcomed. We were given a choice of rooms, all of which were lovely, clean and spacious. Breakfast was fresh, abundant and delicioous. We loved Kenmare and decided to stay 3 nights to rest from our travels. Marion even helped us make arrangements to save a lot of money on our guided tour of the Ring of Kerry. She was always helpful and a lot of fun. Rockcrest was perfectly situated so we could park the car and walk into the adorable village easily. Will highly recommend this lodging to anyone staying in Kenmare. Lovely, well-appointed house with very welcoming hosts, Marian and David. The rooms were beautifully decorated and spacious. The breakfast was fresh and delicious. Great dinner recommendation to trip the Lime Tree Restaurant. And Marian was so sweet to give my husband a hot water bottle to take with us on the rest of our trip, because he was experiencing some neck and back issues. So sweet. Lovely experience all together; hope to return one day. Stayed here for one night.A very comfortable bed and a delicious breakfast the next morning.I'd certainly stay here again and recommend it to friends. We had a wonderful stay in this very comfortable b&b in Kenmare. The room, number 8, was fantastic, with a wonderful bathroom including a tub which was much appreciated as we had been walking the Kerry Way. It was a wonderful stay. We couldn't have asked for more. A very nice B & B! A really beautiful B &B. Our room was clean and spacious with a fantastic view over Kenmare. The owners, are so friendly and helpful. It was a pleasure staying here. I would definatly stay here again. We ended our tour of the Ring of Kerry at the Rockcrest on June 27th, 2014. We were welcomed by the host, David and shown to a beautiful room with a spectacular view overlooking Kenmare and the hills in the distance. The house is clean beyond anyone's expectations, room and bed were extremely comfortable and the gardens are lovely. Full Irish breakfast was delicious. Walking distance to downtown restaurants, pubs and shopping but far enough away as to be very quiet. We would definitely visit again and would recommend to anyone. I recently booked a room at Rockcrest house for a night while staying in Kenmare for a wedding. At vey short notice I had to return home, Marie was kind enough to find another guest to avail of the room, thus I wasn't charged for the room. Cancelling at a few hours notice, I fully expected to be. I hope to return to Kenmare soon and there is no other place I would stay!! This was our favorite place to stay during our 2 week trip to Ireland. It was clean, spacious, very close to town yet I fell asleep each night to the baying of sheep! Delightful. Amazing atmosfere, Couple were so friendly, house beautifull and absolutely clean in side and out side, very good rooms, brand new furniture, good irish breakfast, very good value! kenmare is beautiful, me and my husband loved it all. Nice people, nice house. The room had a nice view but was not furnished with the king bed we were expecting. We didn't question or argue about it. The bath was clean but spartan, with a sloped ceiling. At 5'6" it didn't bother me but had I been 6' it would have. Location is a short stroll to town and we had a wonderful dinner and a fun pub experience. Breakfast was prepared to order- good but not great, service is personal but a bit fussy. my sister and i stayed at this lovely b&b at the end of june 2013. we were delighted with our stay and would definitely strongly recommend this b&b. our hosts were exceptionally accommodating and helpful. our room was so clean and beautifully furnished. a lot of attention to detail. even the towels had a pretty upgraded design. when i return to kenmare with my husband we will book here for several nights. this b&b charges the same as many others during our 9 day trip, but these accommodation were FAR superior to the others. best of all, our host is an amazing cook! her brown bread baked with pumpkin seeds shows how every detail of their service here is exceptional. this b&b should be awarded every recognition possible. thank you for your warm hospitality and perfect b&b! marie h. and beatrice m.
My wife and I visited Rockcrest June 26, 2013. We were thrilled with the accomodations. THe grounds were beautiful and the room was spacious and immaculate. Breakfast was delicious, and the location was perfect-very quiet and pastoral, yet only five minute walk from Kenmare town center. In our 13 day travel, it was our favorite Bed n Breakfast experience. Thank you Marian. Enjoyed our staying there. Short walking distance to Kenmare town. Couldn't fault anything. This was a beautiful place to stay!!!!!!!! Marion was a wonderful hosetess. Great breakfast. I would certainly recommend to anyone and would stay there again!! Quiet location within easy walking distance to town. The B&B is located on a quiet street. The accomodations were very good. We arrived early and the hosts were accomodative. I would recommend this B&B. It is a good value for the money. The house is really beautiful, rather close to the city centre of Kenmare. The rooms are quite huge and very well equipped, I recommend the one with the bow window. An excellent location for experiencing Killarney National Park, the Ring of Beara, the Dingle peninsula, and the Ring of Kerry. Rockcrest House is close enough to walk into the town of Kenmare for dinner each night. An overall lovely time!